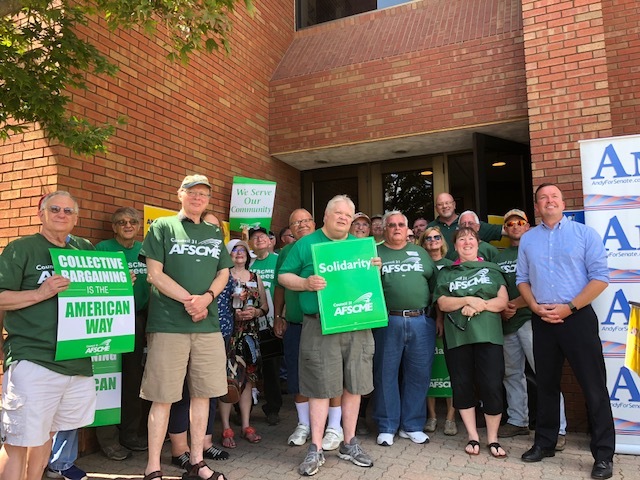 State Senator Andy Manar, representing the 48th District, held a news conference today at the Taylorville Municipal building announcing an endorsement from AFSCME. Bruce Dubre vice president of AFSCME was on hand as well. He spoke about what AFSCME does, and announced their support for Manar. Dubre also complimented the work that Manar has done to help pay back wages to state workers. After Dubre spoke, Manar addressed the crowd, and spoke on what he will continue to do if he is re-elected. He also promised to continue to be vocal on retirement security. Manar is running for State Senate in the 48th district.